Artist:Theodore B. StarrRoyal Crown Derby Porcelain Co.
Vase. 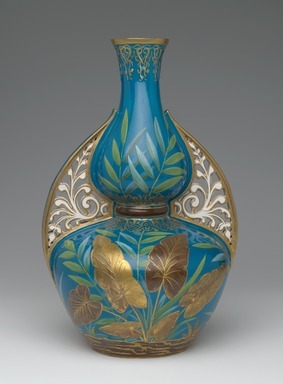 White bodied porcelain with overall light blue glaze and gilt decoration. Molded round bulbous lower body with broad shoulder that tapers to a narrow waist with inverted baluster section above. Two large, opposed pierced handles applied at midpoint of neck and midpoint of lower body. Handles are reticulated with organic Near Eastern motives outlined in gilt. Gilt border on rim. Narrow horizontal brown band at waist. Overall asymetrical Japanese inspired hand-painted green and blue leaf sprays on each side of lower body. Wide brown band near bottom with raised gilt decoration. Molded Near Eastern style bands highlighted with gilt at transition to waist and also at rim. CONDITION - Very good, normal wear.